One crew member on a 54-foot commercial fishing vessel died and a second was rescued by the United States Coast Guard after the mast on the boat broke late Wednesday night near San Simeon. The accident occurred on the fishing vessel Pamela rose about eight nautical miles north of Point Piedras Blancas, according to the Coast Guard. A good Samaritan reported the incident to the coastguard around midnight. 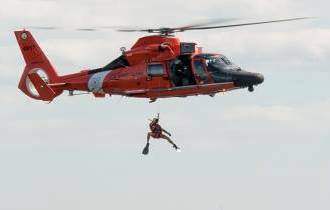 Coast Guard officials in the Los Angeles area then dispatched an MH-65 Dolphin helicopter crew from San Francisco. When the crew arrived at the scene, the rescuers hoisted the injured sailor, a 62-year-old man, into the helicopter and transported him to the Paso Robles Municipal Airport. There, emergency medical personnel picked him up and transported him to Twin Cities Community Hospital in Templeton. The injured 62-year-old is in stable condition, a Coast Guard press release states. A Morro Bay-based 47-foot motor lifeboat crew towed the fishing vessel into Morro Bay Harbor. It is unclear what caused the mast on the vessel to break. The Coast Guard’s Santa Barbara marine safety detachment is conducting an investigation into the incident. Authorities have yet to disclose the identity of the victim.